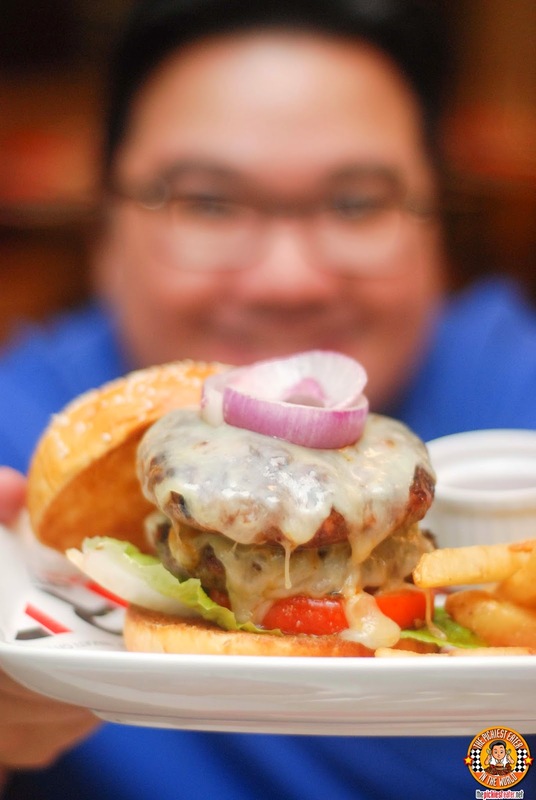 THE PICKIEST EATER IN THE WORLD: RECESS BY CHEF CHRIS: MY FAVORITE SUBJECT! 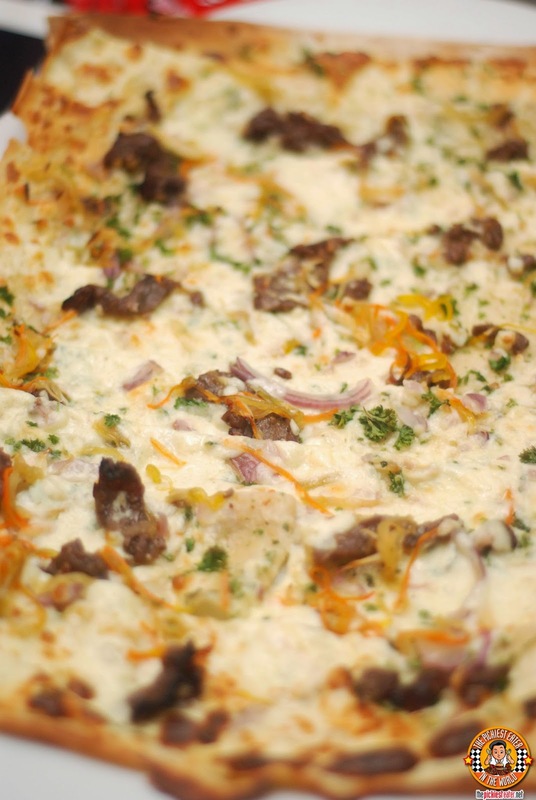 Recess By Chef Chris is conveniently located along the bustling foodie heaven of Jupiter Street. With lockers adorned at the walls, coupled with the library feel, and even going as far as using the symbols from the Periodic Table of Elements (making me think Walter White would be walking through the doors any moment), successfully captures the scholastic vibe (Rina didn't find it funny when I did the "Wild Cats" dance by the lockers. But I thought we're all in this together!?). 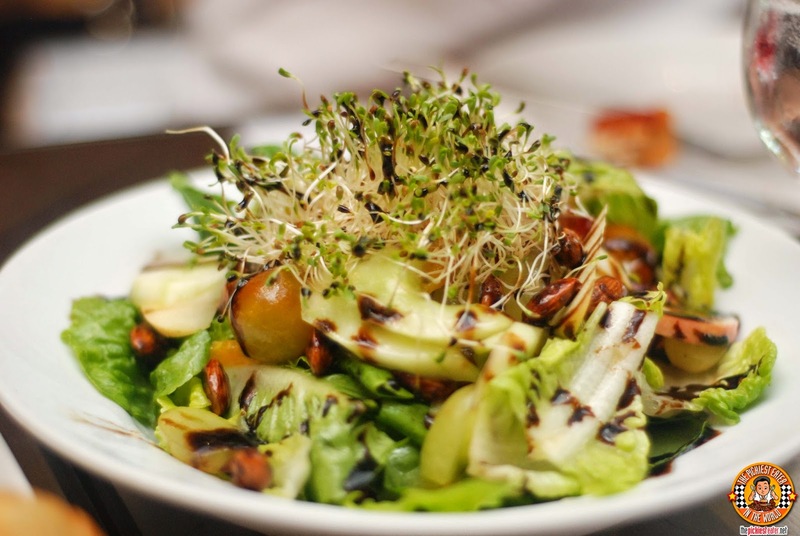 If you are the kind of person that needs a dose of the green stuff to start your meal, you might want to start with the Recess Salad (P390). This was a medley of mixed greens, assorted grapes, apple slices, and orange bits. Rina found it quite refreshing and tasty. While Rina was focused on her Salad, I attacked the Recess Risotto Orbs (P320). 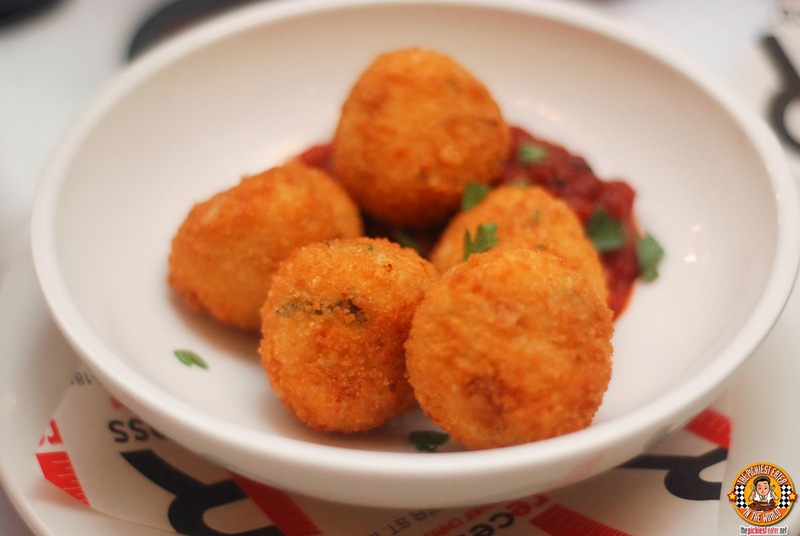 One bite into this crispy fried Italian rice ball, revealed two creamy cheeses, that worked wonderfully with the bits of chorizo and herbs. The dish is served with pomodoro sauce for added zing, but I liked it on its own. 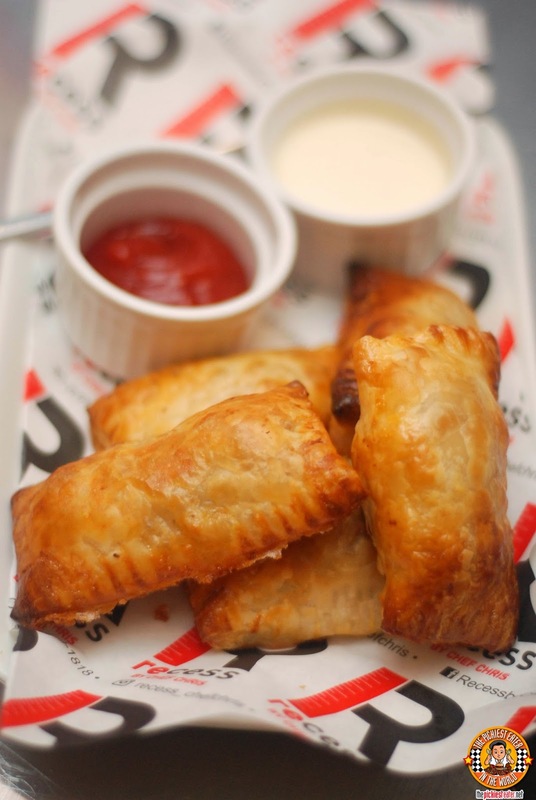 Although I loved those rice balls, my favorite among the starters was the Recess Sausage Rolls (P450). This Chef Chris's special home-made sausage perfectly baked into a golden puff pastry brushed with mustard (presumably by angels) for added glory. Again this was served with some condiments (catsup and horseradish), but the flavor of the roll itself was just so amazing, I felt it was totally unnecessary. Even though I was attempting to save stomach space to make room for the other dishes I wanted to taste, I couldn't resist annihilating at least four of these bad boys. You know how I always tell you guys that I can't eat any pasta dishes with heavy tomato sauce in it, right? Yeah, well, that rule got thrown out the window when Chef Chris sent his Spaghetti Fra Diavolo 50:50 (P490) to our table. The dish demonstrates mathematics, Recess Style. Chef Chris created meatballs made with 50% beef and 50% bacon, which equals 100% awesomeness. 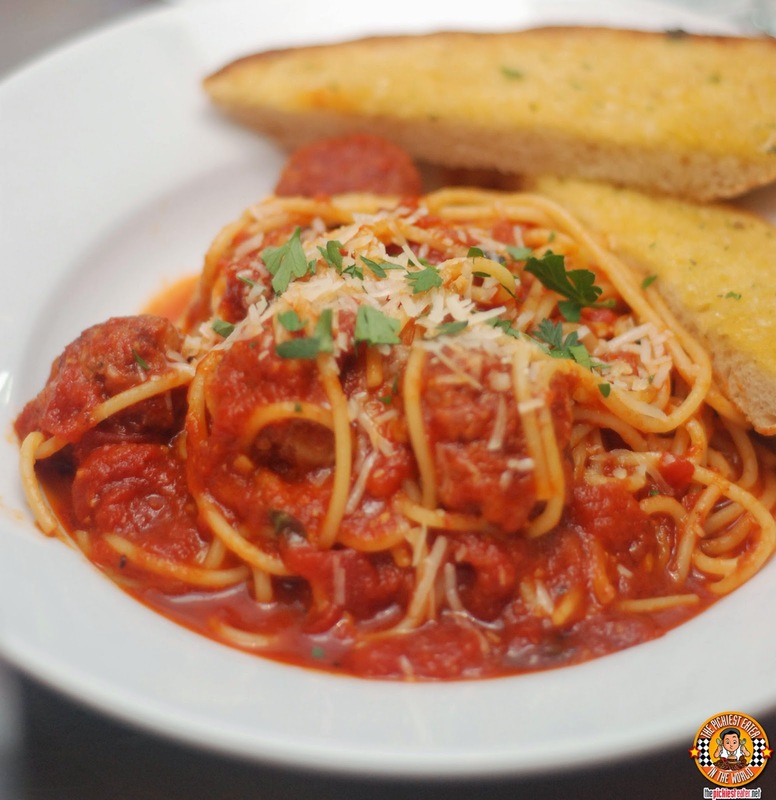 The meatballs are braised in aromatic spiced tomato sauce with fresh herbs and mixed into Al Dente noodles, then sprinkled with parmesan cheese. 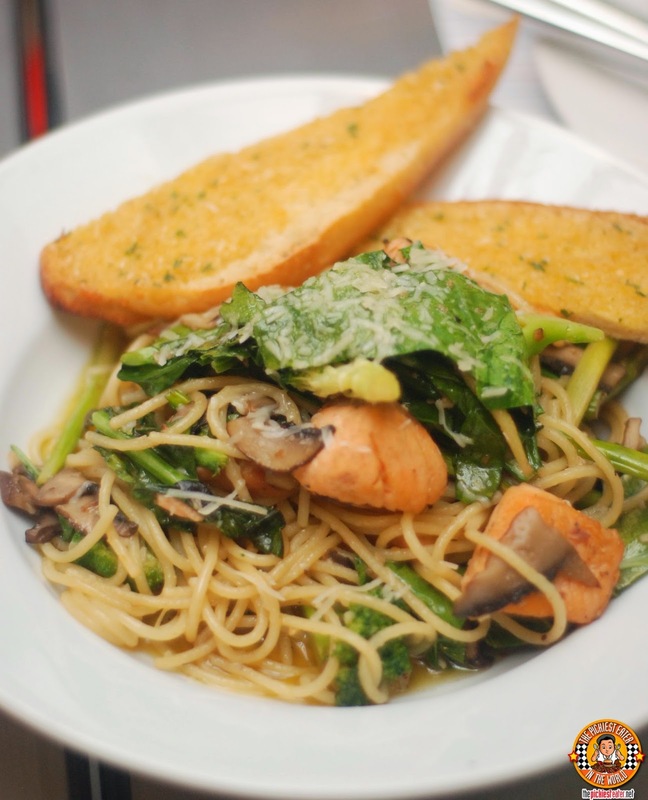 The Spaghetti Varena (P520) consisted of Salmon fillet dices sauteed with anchovies sauteed in virgin olive oil, enticed with garlic, broccoli flowers, asparagus, and fresh mushrooms. I'm a fan of oil based pasta, and I really enjoyed this. And the weird thing about it, is that I enjoyed it more with the noodles alone.. sans the other ingredients. Another dish that I felt the same way about, was the Penne D.M.S. (P540). 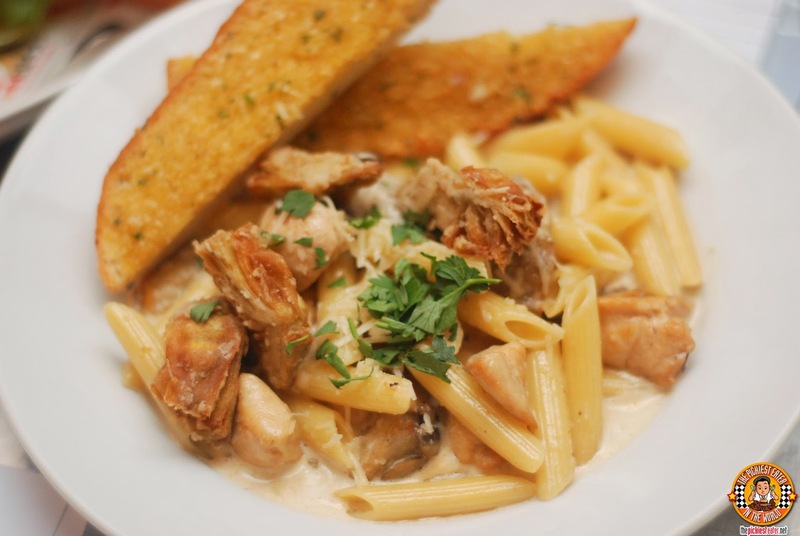 To me, the penne noodles in the cream sauce stood out so much, that it relegated the Chicken fillet slices, fried artichoke hearts, and fresh mushrooms them into bit players. I think it goes without saying that I'm a fan of anything wrapped in bacon. 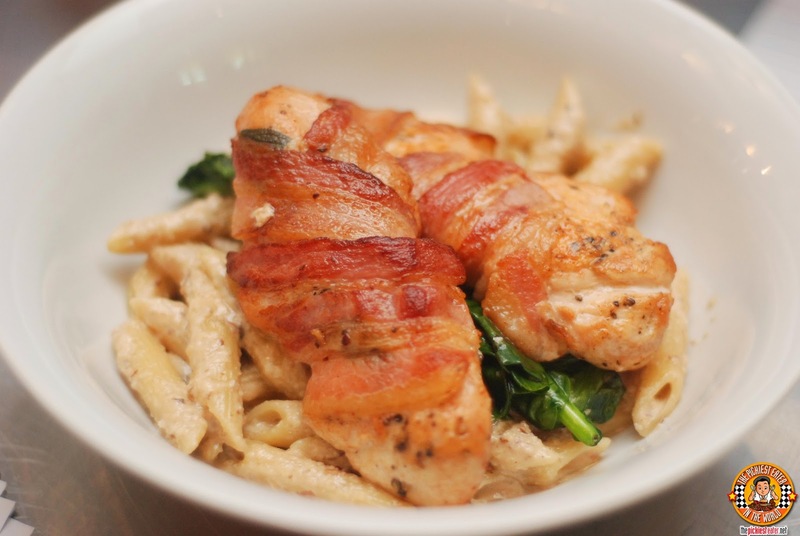 Which is why the Recess Favorite Chicken Fillet Wrapped in Bacon (P690) immediately caught my attention. Perched on top of a Penne Pasta nest, bathed in a stunning walnut parmesan cream sauce and a garlic glazed Italian broccoli bed, it comes as to no surprised why the word "favorite" is included in this dish. 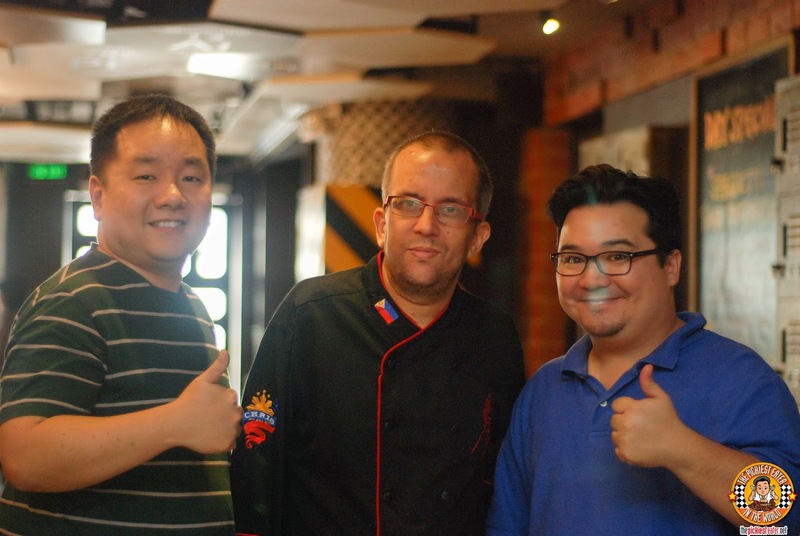 Being of European descent didn't stop Chef Chris from taking on some Pinoy Breakfast favorites and giving it his own trademark flair.. 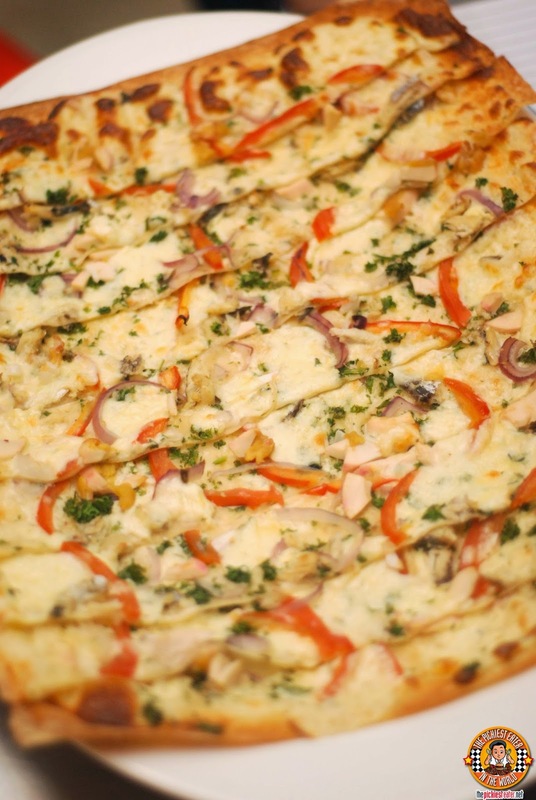 This time, by turning them into delicious gourmet pizzas! The PoTo (P400 for mini, P790 for regular) was made with fine slices of delectably sweet Pork Tocino, Red Onions, and Salted Egg. A wonderful mix of the lightly sweet pork and the egg. Simply Phenomenal. The BeTa (P400 for mini, P790 for regular) Stands for Beef tapa bits, with onion slices, and shreds of pickled sayote (atchara). This didn't sound like it would work at first, but shame on me for ever doubting Chef Chris. It turned out to be my favorite of the lot. The TiTo (P400 for mini, P790 for regular) features bits of Smoked Tinapang Bangus, thin slices of tomato and Salted Egg. ALthough I had to pick out the tomato just to be sure (Hyper acidity), I gotta say I really enjoyed this as well. The smoked fish they used was superb, with the flavor swirling in your mouth with every bite. 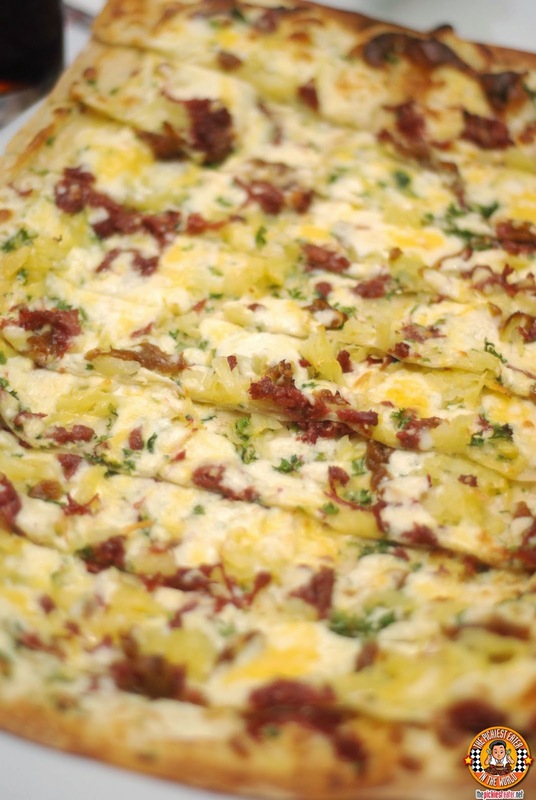 The CoBe (P400 for mini, P790 for regular) is made with sauteed corned beef, egg and caramelized onions and potatoes with fresh marjoram. Although I think the meat needed a little bit more salt so the more pronounced flavor would help identify it as Corned Beef, I still found this to be really good. Something to note is that these aren't pizzas... they're Panizzas! 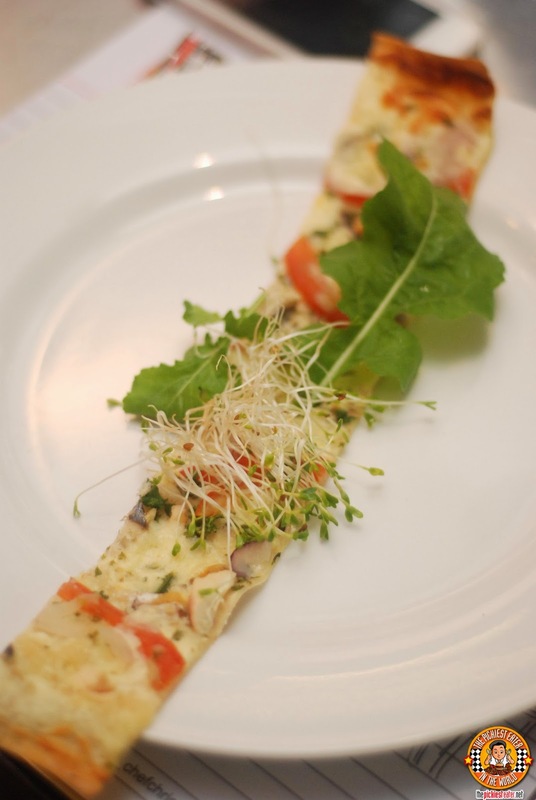 The rectangular pizzas are sliced lengthwise, and you roll it with a bit of Arugula and Alfalfa sprouts. I was perfectly fine with eating the panizza as is, but Chef Chris saw me and said I had to try it with the Arugula and Alfalfa sprouts. 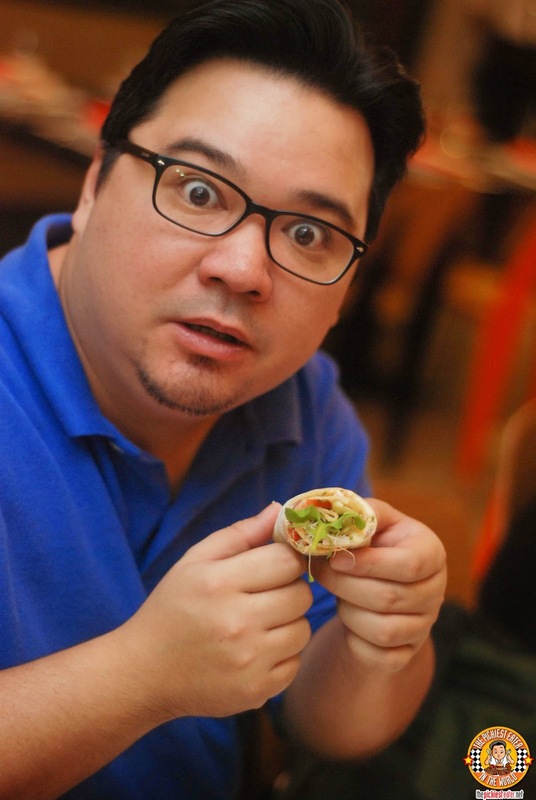 And when a MasterChef like Chef Chris tells you how to eat his food, you follow him, even if it has vegetables. I'm actually glad I did, because it really was quite delicious.. YES, even with the arugula and sprouts hehe. At around this point, I realized that if I kept at the pace that I was devouring the dishes placed in front of me, I wouldn't last till the end of the spread (#FoodBloggerProblems), so I decided to exempt myself from a couple of dishes, and have Rina try it for me instead (We're gonna have jerseys made soon, because WE MAKE A GREAT TEAM *wink wink*). Since the dish was mainly tomato sauce and veggies, I decided to skip the Ratatouille. 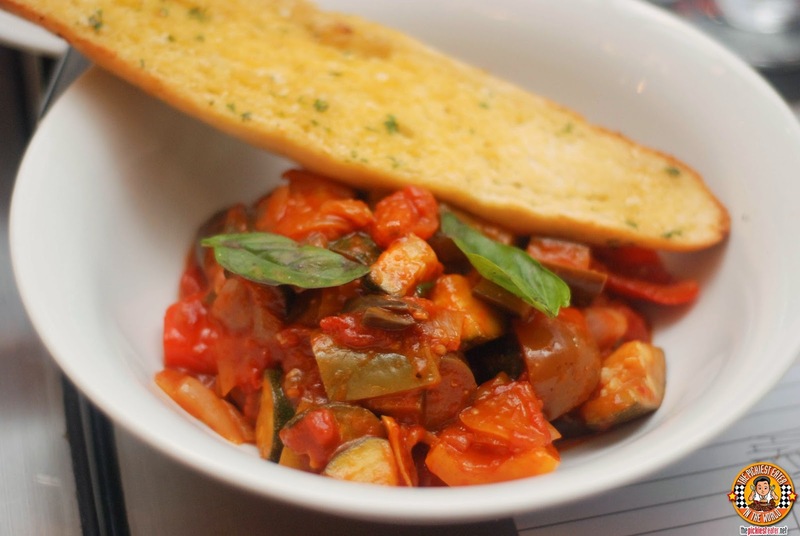 Rina gave it a go, and enjoyed this classic southern french vegetable ragout with aubergine, zucchini, assorted peppers, tomato, onion, garlic, and fresh herbs, served with crisp garlic bread. Another dish that I passed on was the Lengua Estofado (P650). Rina was amazed with how tender imported ox-tongue slices were. 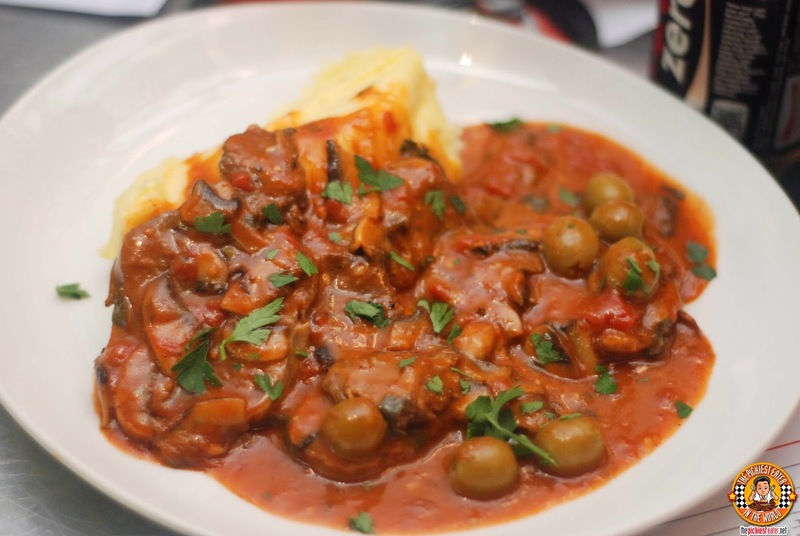 The tongue was bathed in a classic gravy with tomato, mushrooms and green olives, then served over butter whipped potatoes. Many people are often quite surprised when they find out that I really enjoy fish, and Chef Chris brought out two dishes from the sea that were superb. 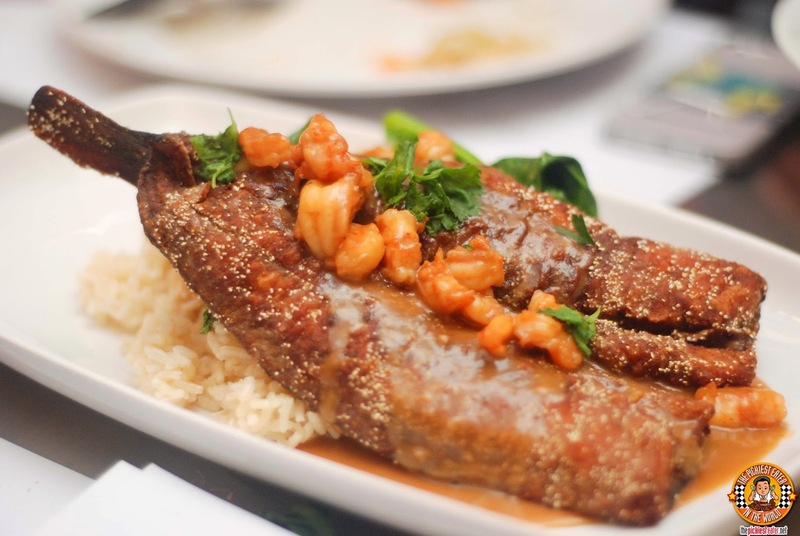 The first being the Creole Style Catfish (P690). This was a golden fried boneless catfish fillet coated with Chef's special spice mix, flour and corn meal, then topped with rich shrimp gravy served on butter rice and collard greens. I think this is soul food at its finest. I usually only eat tuna when it's in the form of a salad sandwich, but the Tuna Steak with Chimichurri Sauce (P740) was pretty darn good. 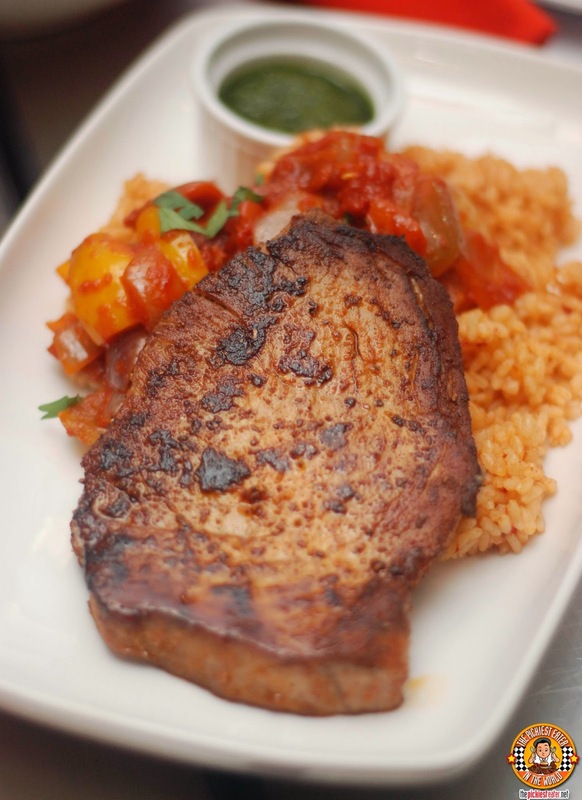 Not only does the natural flavor of the fish shine when mixed with Chef Chris's Chimichurri sauce, but it maintained an uncanny juiciness that is not usually found in tuna steaks I've tried in the past. 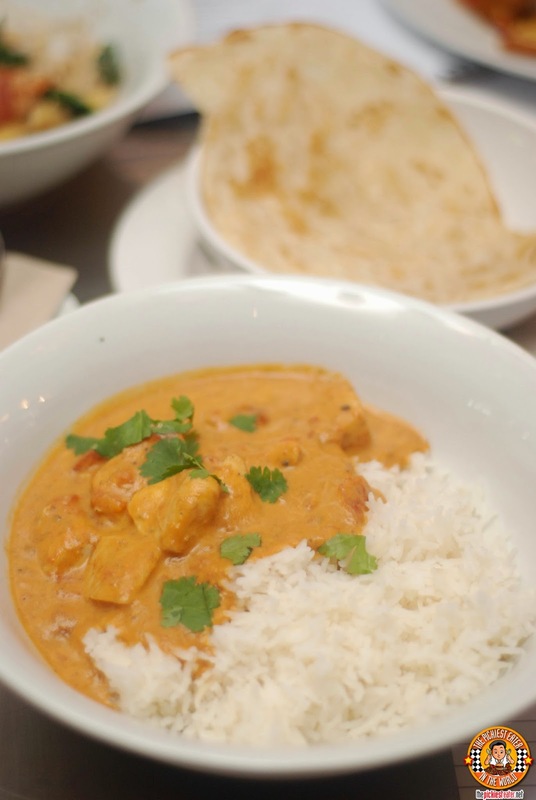 Another winner was the Chef Chris Special Chicken Curry (P540). It was unique in the sense that the sauce was made with an infusion of tamardind as well, giving it a nice twist to the traditional Chicken Curry. The chunks of Chicken fillet were swimming in a gravy made with coconut and tamarind, then cooked with a medley of spices, tomatoes,and coriander, then served over freshly steamed basmati rice. 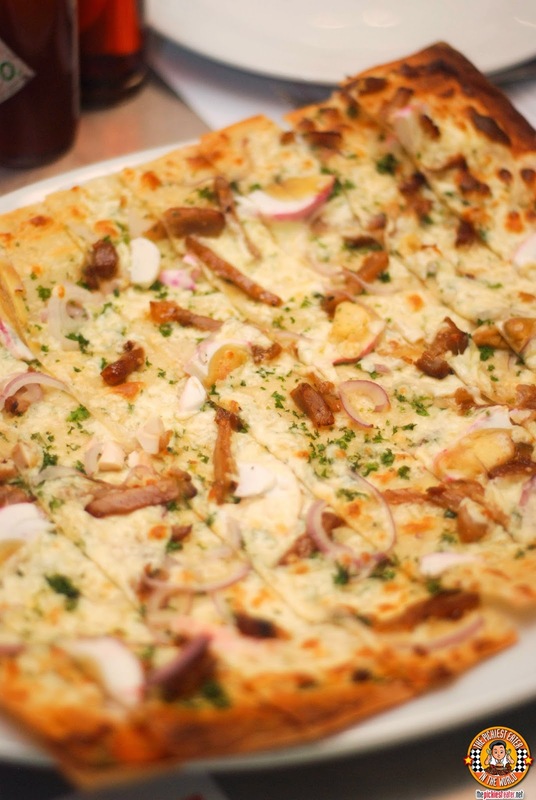 It is also accompanied by an Indian flat bread, which I enjoyed more than the rice (much to the delight of Rina.. It meant more rice for her). I don't think there are very many people in the country that can make sausages as well as Chef Chris. The Sausage Rolls was the first piece of evidence to back up that statement. The Grilled Pork Bratwurst with Spicy Mustard (P590) is the second. 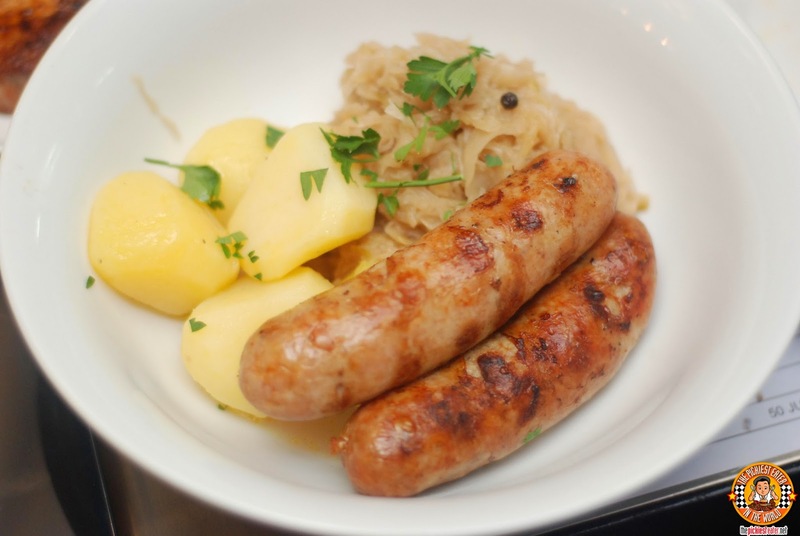 The sausage packed with meat let out a juicy snap with every flavorful bite, and the slow braised apple saukerkraut and boiled parsley potatoes were a nice compliment. A dish that nearly caused my head to explode was the Recess Double Trouble (P490). I've had two patty burgers before, but none quite like this. 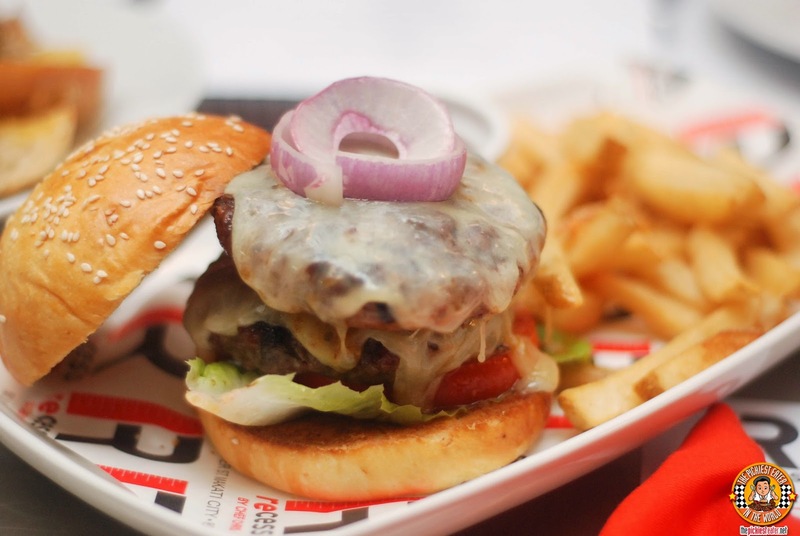 Imagine this: one Pure Beef Patty.. and one Sausage Patty topped with Cheddar Cheese, grilled tomato, onion, lettuce, served with golden fries. As you can imagine, it was as mind-blowing to "Red Viper" levels (GoT fans know), but I recommend you note to your waiter that you want your beef patty done to Medium, just to make sure your beef maintains its juiciness. The Carolina Style Barbecued Mustard Lamb (P990) was the best thing I tried the entire night. In fact, it's one of the best things I've tasted in my entire life. I started oohing and aahhing and rolling my eyes to the back of my head every time I took a bite, I think I started creeping Chef Chris out. Thankfully, he didn't call security on me, but if he did, I would have grabbed the lamb before making a run for it. The lamb ribs were slow roasted to almost cotton candy like proportions, and the mustard rub just really melded beautifully onto the meat. Seriously, this was one of the best thing I've ever tasted. 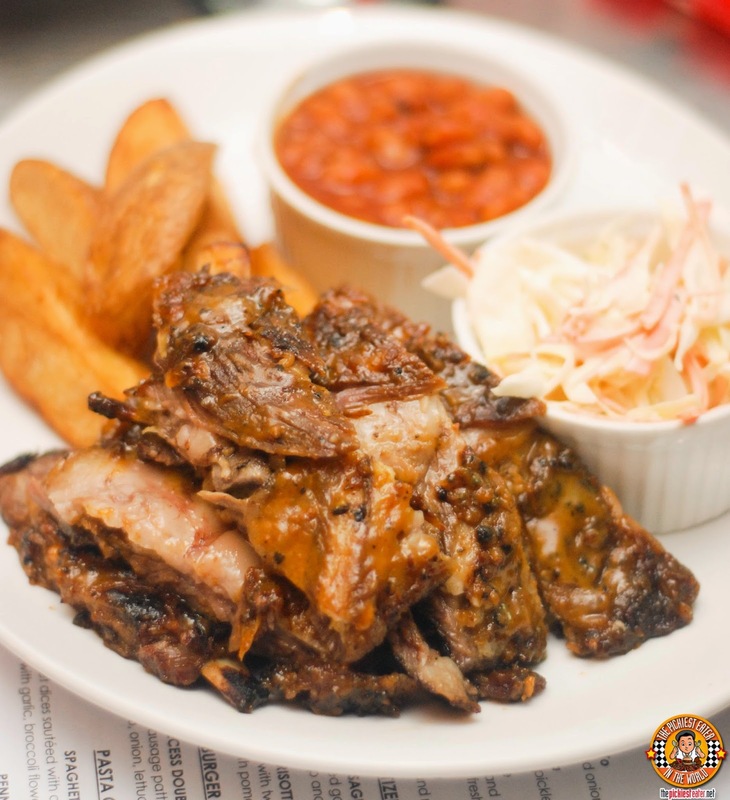 Also served with home-made cole-slaw, golden fries and Chef Chris's baked beans. After practically single-handedly annihilating the lamb (I hid it under the table and told the others Rina finished it), I felt little too stuffed for dessert. That was until they brought out Chef Tinlou's Lemon Cheesecake (P290). 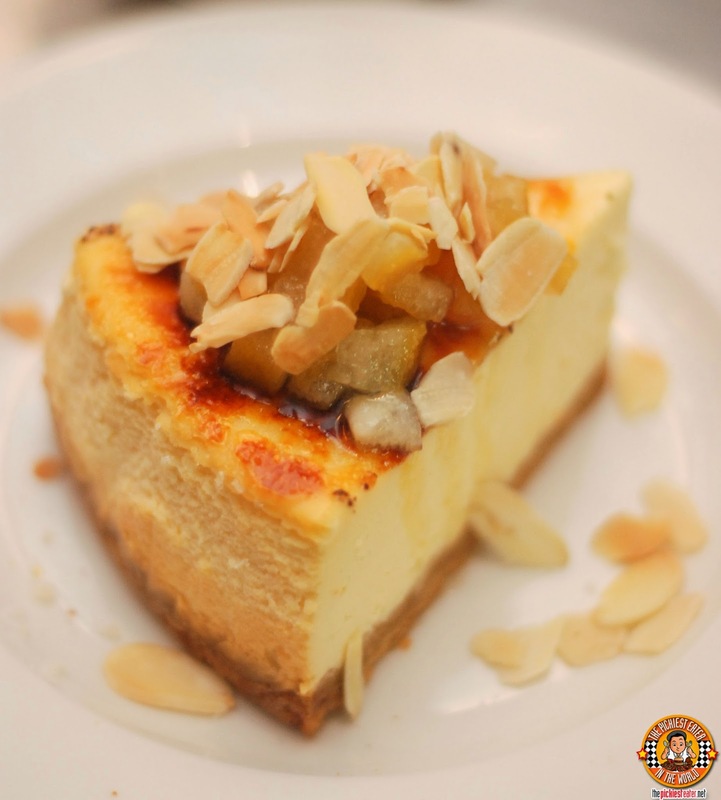 A refreshing, sugar crusted cheese cake that is not overly rich, lemon peel sauce for a little tartness and garnished with almond flakes. 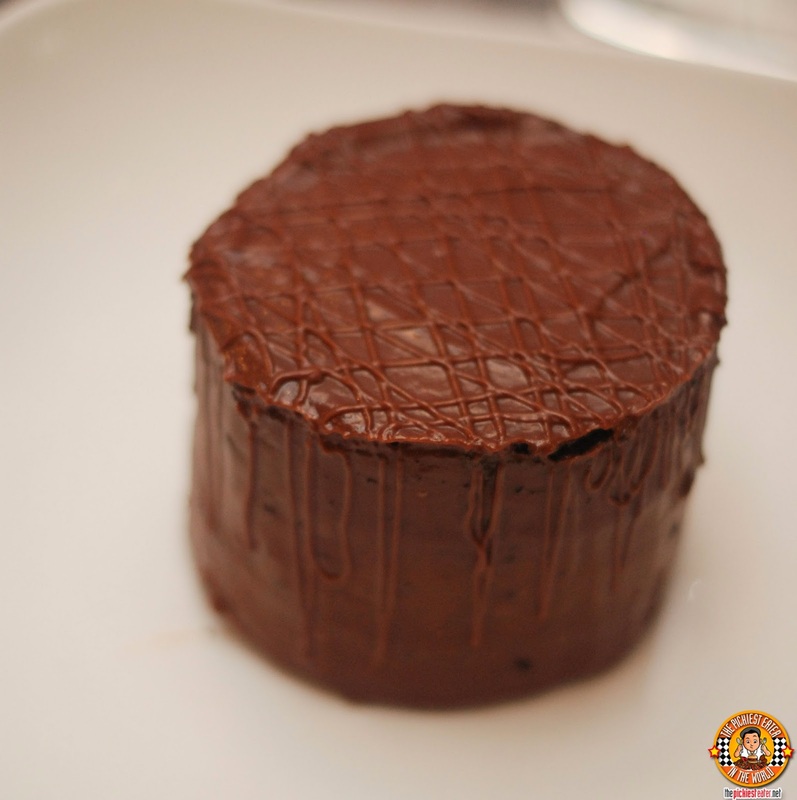 Rina, on the other hand, focused on Chef Tinlou's Valrhona Decadent Cake (P320), which is served with caramel sauce. I normally don't like Pavlova because I find it a bit too light for a heavy eater such as myself, but the Recess Pavlova (P280) changed my mind totally about that. 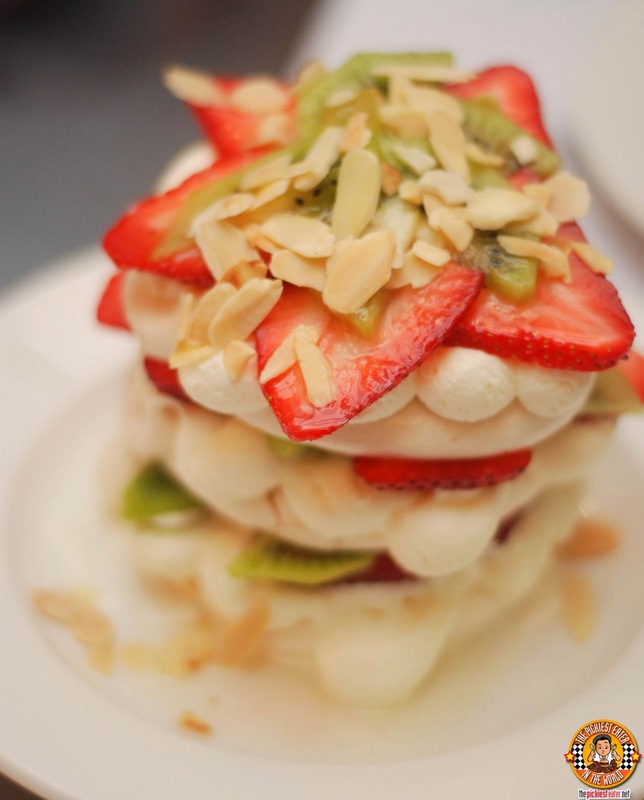 This meringue dessert with fresh kiwi, strawberry, and almond flakes had the right sweetness that partnered well with its light, airiness. A perfect way to end a HUGE meal like this. I'm going to give it to you straight. Recess by Chef Chris is a little heavy on the pocket. But when you are served world class food such as this, I'll tell you, you won't hesitate going back. When I go for my next visit, I will most definitely order the lamb despite its price tag, because there's a difference between a restaurant being simply, "expensive" and "worth it", and Recess by Chef Chris is absolutely worth every cent.